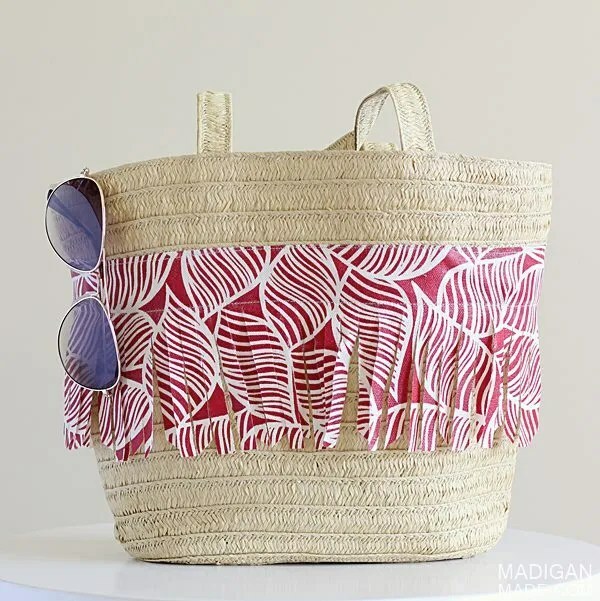 MAKE: a DIY decorated summer straw bag. I’m not sure if you can sympathize… but I have kinda a love-hate relationship with fringe. Part of me wants to enjoy the texture and movement that fringe creates on things. I do. But most of the time, especially on rugs for some reason, I just want to comb and straighten the strings out! 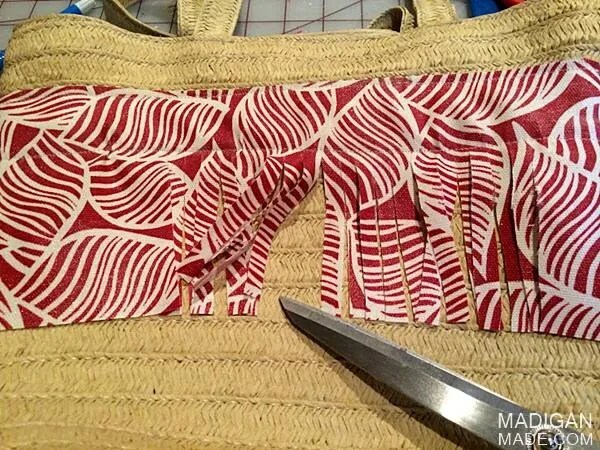 So, when this DIY summer tote did not turn out as I had planned (more on that soon) and I ended up with a fringed look on the bag… I had mixed feelings. But at the end of the day, I decided that these crafty bumps in the road happen for a reason. 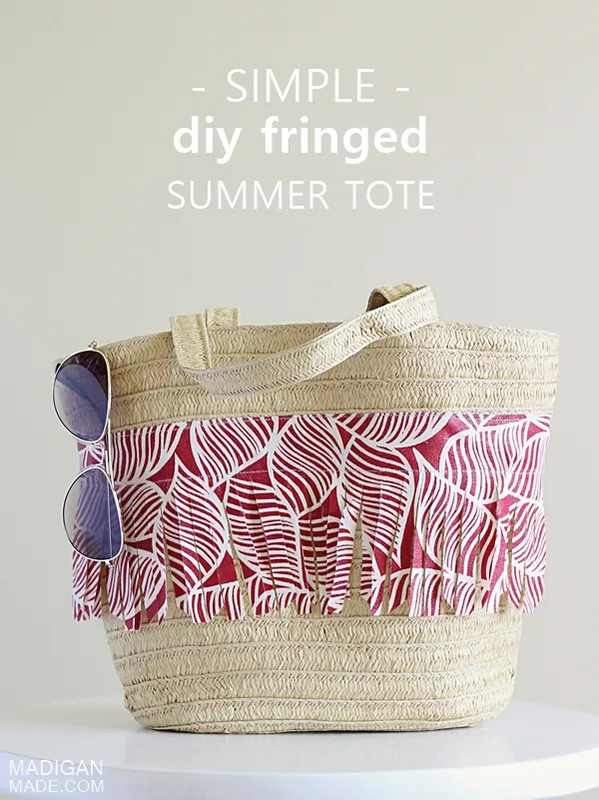 I think fringe was exactly what this tote needed… the bag looks laid-back and ready for for a pool party or luau. 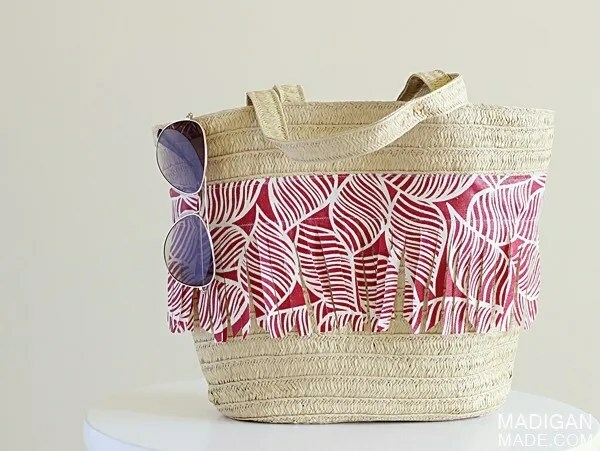 To make it this tote bag, I picked up an inexpensive paper straw tote and found some leafy looking fabric in my stash that reminded me of summer. 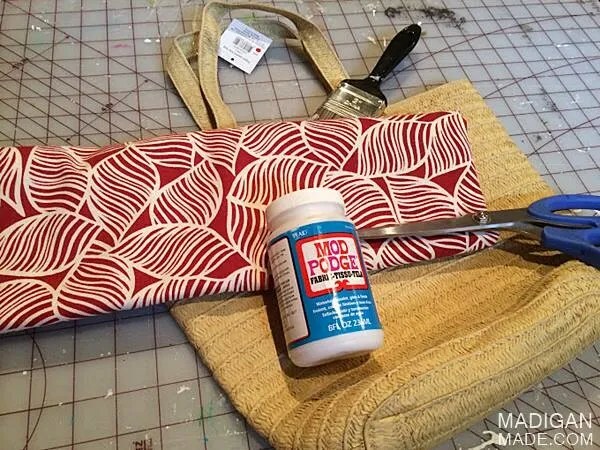 I cut a panel of the fabric that would wrap around the tote and brushed a coat of Mod Podge Fabric formula onto it. 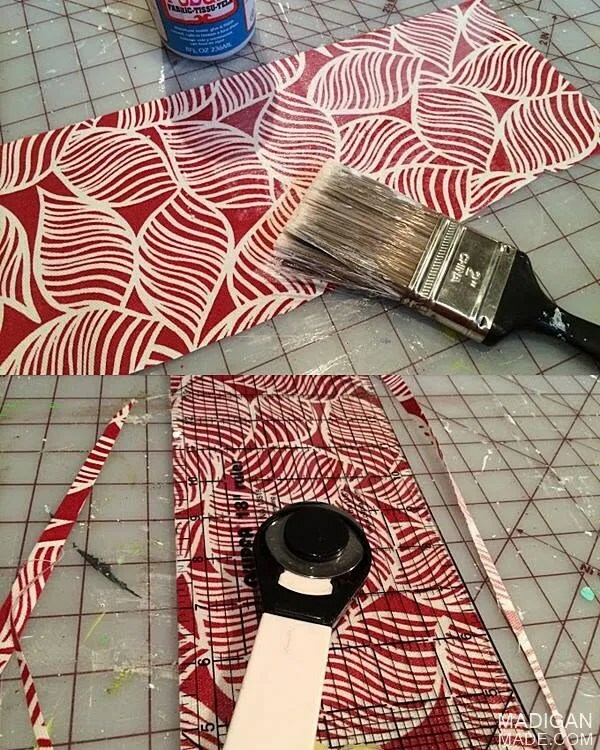 This decoupage not only protected the fabric, but it also allowed me to cut the fabric without fraying. Once the fabric was dry, I cut out a 4 inch wide band out of the material, using a wide ruler to guide me. See, no fraying! Then, I started to sew the panel around the wide of the bag. This is where I ran into trouble. I had intended to sew the panel’s top and bottom to the tote. I knew the fabric would not lie flush along the tote since it was tapered, but I figured that I could add a few gathers/pleats every now and then. But, I did not give myself enough fabric length to really create enough pleats in the fabric for it to sit correctly. So, I decided to wing it! After I sewed the top of the fabric edge all the way around the tote, I went back and sewed another line about one inch down into the fabric. Then, I got out my scissors and started to cut strips of fringe into the remaining fabric that hung down. I trimmed some lengths a little shorter or notched the ends at a angle to help add movement into the fringe. Now I have a cute little fringed tote that is ready for a summer party! I’m trying to embrace the random way the fringe hangs and resist the urge to straighten it out. I do like the way the fringe looks on the tote. 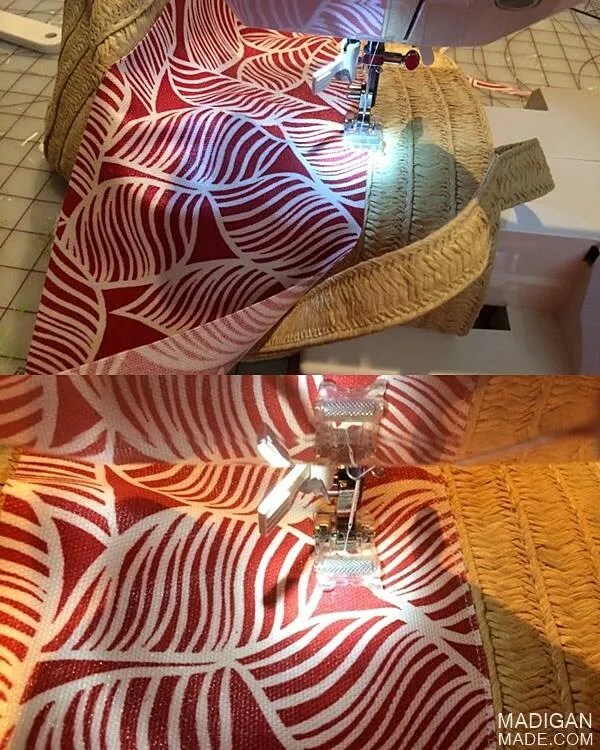 Since it is only one layer of fabric, it does not really tangle up. And if the fabric strips fray or tear, it’s all good… it will add to the breezy summertime look, right?